THE MAYBELLINE STORY : Maybelline Story author Sharrie Williams on the AZTV Show. Maybelline Story author Sharrie Williams on the AZTV Show. 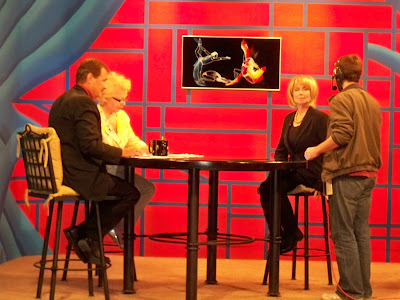 Please click here to see my AZTV interview. Getting miked for my interview with lively and lovely Tanya Mock and Lew Rees. I have been asked back to do a cooking segment on March 30th. I will be baking my grandmother Miss Maybelline's famous Pineapple upside-down cake in a skillet.